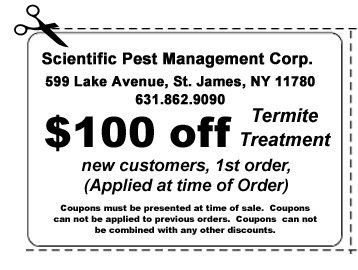 Scientific Pest Management has been providing pest control and termite services for over 50 years. That’s four generations of experience using the most advanced equipment and materials available. Our environmentally conscious methods are the most effective pest control techniques available in the industry. When it comes to pest control we have it down to a Science. Our success has been delivered by satisfied customers. For over 50 years the primary source of advertising has been word of mouth. With this in mind the Scientific family business has focused its efforts in providing quality pest control services not in expensive advertising. You can count on these savings being passed on to you. The commitment to our customers and our future clients is to provide the highest standards in professional services and to maintain a relationship of honesty, integrity and confidence. Our commitment has earned us the reputation of excellence in customer satisfaction. Scientific has been in business for over 50 years at the same address. Family owned and operated. with over 100 combined years of experience working in the termite industry. We service Nassau and Suffolk Counties. Scientific is determined to provide our customers with quality and effective services. Our customers love us. That is why 99% of our work is received through recommendations. Scientific uses the latest technology in the termite industry. In an effort to provide our customers with lower costs than our competitors while not sacrificing service quality, Scientific does very little advertising and does not pay employees based on commission from sales. Your homeowner’s policy doesn’t protect you against the one thing that causes more damage than tornadoes, hail storms and hurricanes combined – termites. Before undergoing a remodel of your home please call Scientific as this would be the optimal time to prevent future termites issues in your home. When putting any floor covering over a slab i.e. wood floors, tile, marble ect. Please call Scientific so we can come in when the floor is bare and check for signs of termites or areas that can cause future termite issues. The same applies to remodeling of any rooms in your home. If you are covering cement stoops with brick or slate, or adding a patio or deck please call us. Be sure sprinklers do not hit the house as this increases the possibility of any insect infestation in your home. Make sure the soil, leaders and gutters send water away from the home so no water puddles up against the foundation. "We just signed up as of December 2018 and so far very good service." "Scientific was great! I don’t live in the area and needed my property treated for termites as I am about to sell. They were very helpful, we handled everything by phone. I appreciate that they give you half hour notice before they come as opposed to a 4 hour window."